The purpose of the CA Worship Arts team. 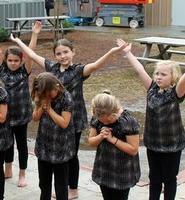 First and foremost our dances/dramas are an offering of worship to an Audience of One. It will also be an opportunity for the students to testify of God’s love for them and others by bringing the Gospel to Life through dance and drama. Christian Academy’s desire is to see each participant move into a place of deeper heartfelt love for their Savior, a stronger confidence in who they are in Him, and a hunger for the plans He has for their lives (Jeremiah 29:11). Have FUN. A FUN way to learn more and grow deeper roots in Christ. A FUN way to share our faith and the Gospel. Finally, a FUN & healthy way to express themselves.